The “cotehardie” as it is often described and seen in historical costuming circles is a long, fitted, buttoned gown with tight, buttoned sleeves. Though popular to recreate, it is relatively rare in artistic sources from the period. The following images from late 14th and early 15th century sources are the few I have come across to date, after a number of years of figural art survey. I have excluded certain ambiguous English brass rubbings due to inconclusive visual access to their clothing. 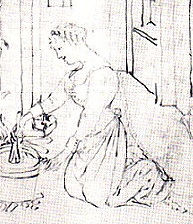 Sleeve-occluding mantles are the biggest offender, as they prevent the viewer from seeing whether or not the lady wears one or two fashion layers. Many thanks to Charlotte Johnson who assisted in this search. 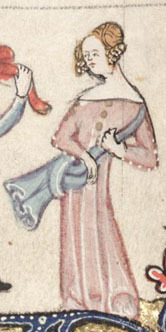 Lancelot et la demoiselle à l’ermitage from a manuscript entitled Lancelot du Lac (Français 122, Fol. 143), mid-14th century, France/Belgium. The Romance of Alexander, circa 1344, Flemish. Bodleian Library Manuscript 264, Folio 130v-b. This example is a bit weak as it is not clear that the circular gold objects on the front of her dress are buttons and not brooches of some kind. The same gold decoration appears at the tops of her sleeves too, even though smaller white dots indicate regular sleeve buttons. 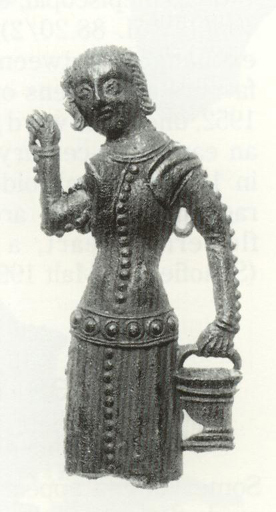 A milk maid from late 14th century London, England, cast in pewter; catalogued as fig. 307a from Brian Spenser’s Pilgrim Souvenirs and Secular Badges. Since the bottom half of this figure is cut off, one might be tempted to argue that the figure is a man, except that the milk maid image is a common one in secular pilgrim badges. This one shows the grooves of the yoke the maid carries and a milk pail in her left hand. “Though popular to recreate, it is relatively rare in artistic sources from the period.” How many of those reconstructions are based on (or inspired by) the Moy Bog Gown, which is an extant (partial) dress that had buttoned front and sleeves? Your paper on Loving the Layers is a helpful read as I think about growing my 14th century wardrobe!